Featuring a monochrome micro-check print, this Marina Rinaldi coat is a smart choice. It’s so versatile and beautifully cut that it will slip seamlessly into your tailored wardrobe. Wear open or with the optional waist cinching belt. 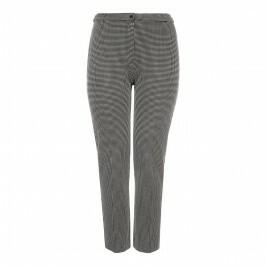 Team with the matching trousers for a polished full suit look that’s ideal for the office. Monochrome micro-check long jacket. 65% Viscose, 30% Polyamide, 5% Elastane. Lining: 67% Acetate, 33% Polyester. Do not wash in Water. Dry Clean Only.